I cooked this dish for dinner last night as I had some pineapple leftover from making pineapple tarts. My sister, who dropped by to collect some curry puffs, tried some and loved it! This is similar to the chicken version that I made a couple of weeks ago, except that it uses pork instead. An utterly delicious alternative to the soy-braised pork belly that I usually cook for the kids. And I can still have my chilli at the same time! In a bowl, combine half the garlic, 1 tbsp of the fish sauce, the oyster sauce, dark soy sauce, sugar, 1 tsp salt and 1 tsp black pepper. Mix well, add pork and coat in the marinade. Cover and refrigerate for 30 minutes. Heat oil in a large saucepan over medium-high heat and brown the pork for about 3-5 minutes until golden all over. Add pineapple, remaining 1 tbsp fish sauce and 1/2 cup water. 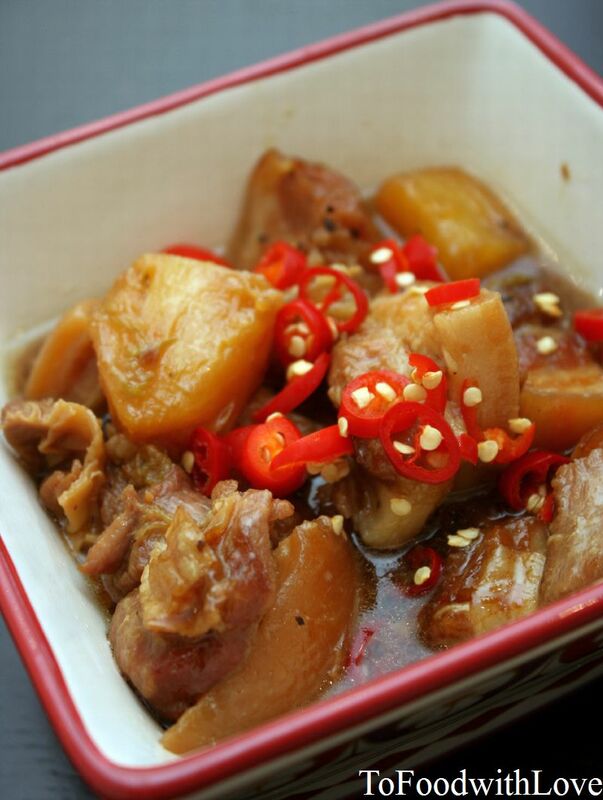 Reduce heat to medium-low and simmer for 1-2 hours or until pork is tender. Dish out into a bowl and garnish with sliced chilli, and serve with jasmine rice.